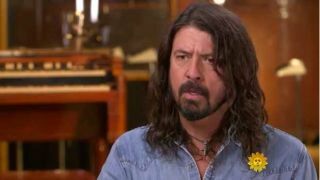 Dave Grohl has given an interview to CBS programme Sunday Morning, in which he details why he shied away from songwriting when he was part of Nirvana. Telling anchor Anthony Mason why he only began to explore songwriting after his life in Nirvana, Grohl said: "When I recorded what became the first Foo Fighters record [Foo Fighters, 1995], I didn’t think it was a record. I just wanted to get up and go out and play something. Even if no body ever heard it. "Long before then I’d been recording songs on my own and never letting anyone hear them, because I didn’t really think they were that good. I didn’t like my voice. I didn’t think I was a songwriter. And I was in a band with one of the greatest songwriters of our generation, so I didn’t really want to rock the boat. "That’s the famous joke: What’s the last thing the drummer said before he got kicked out of the band? ‘Hey guys, I’ve got some songs I think we should play.’ So I just kind of kept it to myself. "But there was someone who we knew from Seattle. After Kurt died he wrote me this card: ‘I know you don’t feel it now, but someday the music is going to come back, and it’s going to heal you.'" He went on to explain his initial insecurities about his singing voice: "I wish that I could sing like John Lennon or Adele or Josh Groban or whatever, you know. I wish I could. "But, you know, I was raised on some really dissident, noisy, crazy, punk rock. So a lot of my favourite vocalists, most people wouldn’t consider singers. They just belt it out, just scream it, but the raw passion in that is what I appreciated the most because I find beauty in imperfection and it’s something I love about our band. "We have a saying in this band: ‘If it gets any better, it’s going to get worse’. And it took me years to get over trying to be a lead singer. It took me a while, and then I thought, ‘You know what, I’m just going to go out there and belt it out’. And then it started to get fun." On his time in Nirvana, Grohl added: "When most people think about Nirvana, they think about a video or a song on the radio. But to me it was a really personal experience with some friends that went from sleeping on floors to then being the number one band on the charts. "I went through a really dark period [after Kurt died] where I couldn’t even really listen to the radio because it broke my heart even just to hear music. "Still to this day whenever I see a new artist that’s young that blows up and becomes gigantic overnight, I kind of get worried for them – I don’t think anyone’s cut out for it. I was the kid with long hair in my face behind drums that looked like washing machines and I could walk in the front door of a Nirvana gig and not really get noticed, so I didn’t have to suffer a lot of the pressures that Kurt did as the frontman."